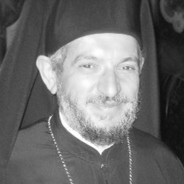 His Eminence Archbishop Serafim (Kykotis) of Zimbabwe and Angola was born in Galataria, Cyprus (1961). At the age of twelve, he became a novice at Kykkos Monastery. Ordained deacon in 1983, he studied theology at the University of Athens (1987), pursuing graduate studies in Patristics at the Universities of Canterbury, Oxford and Durham. He was ordained priest (1991) and Bishop of Kenya and Tanzania (1997), and elected Metropolitan of Johannesburg (2001) and Archbishop of Zimbabwe and Angola (2010). He served on the board of Syndesmos as Dean of the Orthodox Seminaries in Africa. He is a member of the Central Committee of the WCC, member of the Southern Africa Faith Communities Environment Institute, and director of the Office on Climate Change for the Patriarchate of Alexandria. Since 2002, he has participated at the United Nations COP conferences. He has authored Church and Environment (Athens, 2012) and participates in the Orthodox-Anglican International Theological Dialogue.